Members of InterNations, an international expat community, put Portugal among the top ten places to live by weather. But this country has much more to offer than the sunniest continental european capital. Some countries value good weather more than others, but the majority has spoken: Portugal deserves the 10th place on the list, when it comes favourite places to live because of the weather conditions. Over 14 000 people living in 195 countries participated in the survey. Costa Rica, Cyprus and Greece make up the top three on the list. Besides the weather, 62% of expats who participated in the survey rated their personal safety in Portugal as very good, which is 20 percentage points above the global average. Portugal also ranks third as the “Most Welcoming Countries” and fifth in “Quality of Life” and “Ease of Settling in” indexes. If those are not enough reasons to start thinking about moving to Portugal, environment lovers will love the next one. Portugal got an hororable 7th place in the Environmental Performance Index. This ranking developed by the Yale University analyses the States’ environmental policies. Did you know that earlier this year, Portugal ran for four straight days on renewable energy coming from wind, solar and hydro-generated electricity? If we are changing your view about Portugal for the better, you are not alone. International perception of Portugal is up for the third year in a row, according to a report by the consultant “On Strategy”. Economic potential and social context were the fields that registered a greater increase. As Portugal becomes a more and more known touristic destination, the reputation among foreigners tends to increase. Additionally, Portugal remains a stable and safe destination, while other typical destinations are facing some political instability or the threat of terrorism, as we have talked about before. Affordable and safe, a cosmopolitan city with good weather and nice beaches. As the dollar gets stronger, you should really consider Lisbon as a retirement destination, says US News. Touristic attractions: as one of the oldest cities in Western Europe, this city offers multiple outstanding places to visit, such as Jerónimos Monastery, Tower of Belém and Praça do Comércio. A charming city: as US News puts it, “Lisbon offers the same Old World cosmopolitan flavor” as other better known European capitals, but with good weather, and pleasant, clean beaches. Affordability: Lisbon is one of the most affordable capital cities in Western Europe. The quality of life you get compared to the cost of living is unmatchable. Healthcare: Lisbon ranks high also when it comes to healthcare quality, and counts with some of the best health specialists in Europe. Plus, medical care is considerably more affordable in Lisbon than in the USA. Language is not a barrier: most doctors and medical staff speak English. If you are considering visiting or moving to Portugal and want to better understand how to access healthcare services, we can help. Safety: Portugal stands as one of the safest and most peaceful countries in the world. Even in its capital, crime rate are low. Language: There is an established English speaking community in Lisbon, and English is the second most spoken language throughout Portugal. Cultural and recreational activities are also mentioned by US News, and moving to Portugal is now easier thanks to the Non Habitual Regime and Golden Visa status. You can read the full article – that concludes by describing Portugal as a “welcoming haven”. There are many other unique characteristics that render Lisbon a great choice for foreign retirees. Keep visiting our blog to learn more. Following our previous blog post about why Americans should retire to Portugal (click here to read it), we are now sharing an article from The Washington Post with a financial guide to retire abroad. Plan a retirement abroad requires careful planning and many places can be cheaper than the United States. Healthcare – Medical Port can help you with this. We have special healthcare solutions for foreign residents in Portugal that have health insurance or not. The For Health card is a solution for those foreign citizens who live in Portugal and have healthcare needs that aren’t usually covered on health insurances. Bank accounts – It is advised to keep a bank account in the home country and another in the country where you are retiring. Social security – Portugal is one of the countries where American citizens can move and still receive their social security benefits. Pay taxes – Retirees will still need to pay taxes in the United States. Buy property – While some countries make it hard for foreign citizens to buy property, others – like Portugal – make it easy like any other national citizen would. Spend the retirement years in a foreign country is an exciting idea for many Americans who look for better weather, affordable cost of living and the opportunity to experience a new culture. Portugal is becoming increasingly popular as a retirement destination and has received for the past few years the top places on the best retirement abroad rankings (click here to read more about it). To learn more about Medical Port’s solution for healthcare for foreign citizens in Portugal, the For Health card, click here. Read the full article on The Washington Post, by clicking here. Once again, Portugal is in the news as one of the best places to retire abroad. During the first days of 2016 were revealed two important rankings regarding the best places to retire abroad: one from Live and Invest Overseas and another from International Living. Both rankings highlight Portugal as great place to retire abroad, as they did for the past few years. Live and Invest Overseas, considered the Portuguese region of the Algarve as the number one region in the world to retire abroad. This distinction is awarded to the Algarve for the 3rd year in a row. The Algarve, in the south of Portugal is known for its white sand beaches, low cost of living and large expat English-speaking communities. 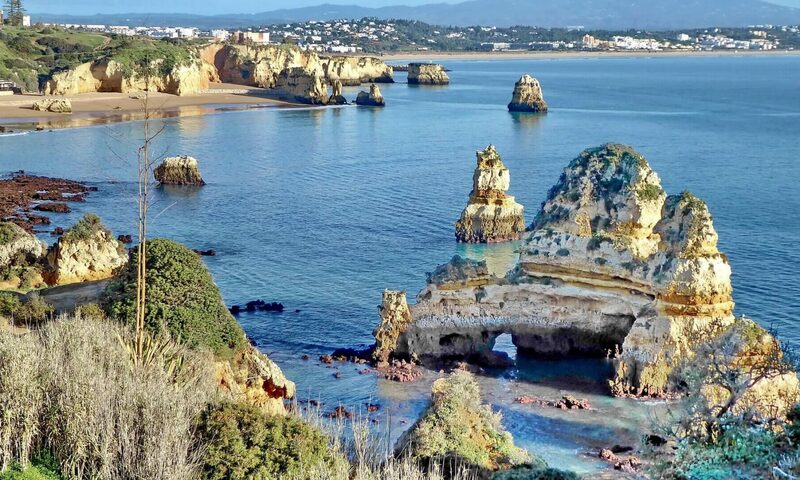 The Algarve is considered a paradise in Europe where the sun shines all year round with mild temperatures. International Living put Portugal in the 10th place this year. The country drops one place from last year, but still makes the top 10. Once again categories where Portugal received high scores were Infrastructures, Healthy Lifestyle (this category was added this year), Climate and Cost of Living. Over the last few years Portugal became a popular destination for foreign retirees. Helped by tax benefits programs – the Non-Habitual Regime for European citizens and the Golden Visa for other nationalities – moving to Portugal was never so attractive to foreign citizens from around the world. For those considering retiring in Portugal and concerned about their health, Medical Port developed the For Health Card. This card offers discounts in consultations and medical procedures even those that aren’t normally covered by health insurance. For Health cardholders that also have health insurance can benefit from using both when recurring to health services. According to a report from Henley & Partners, the global leaders in residence and citizenship planning, Portugal’s Golden Residence Permit Program is the world’s best residence-by-investment program in 2015. This program allows foreign citizens to invest in Portugal and obtain a residence visa. Among the 19 residency programs for foreigners analyzed by Henley & Partners, the Portuguese one is the one that offers more advantages to foreign investors. Portugal is followed by Austria (2nd place) and Belgium (3rd place). The programs were ranked according to 10 indicators: Reputation, Quality of Life, Tax, Visa Free Access, Processing Time and Quality of Processing, Compliance, Investment Requirements, Total Costs, Time to Citizenship and Citizenship Requirements. Portugal ranked highest on “Total Cost” meaning the initial investment required is lower when compared to other programs. Portugal shared the top spot with other countries in the following indicators: “Tax”, “Visa Free Access”, and “Processing Time and Quality of Processing”. Meaning that foreigner investors have light tax burdens and the processing procedures are quick and efficient. Medical Port serves foreign residents’ healthcare needs through the For Health Card, a card that gives access to the top private healthcare providers in Portugal with discounts and specialized services. To learn more about the For Health Card please visit our website. Portugal is ranked as the 5th country in the world with the best quality of life. Internationally recognized expat website, Internations recently announced the 2015 quality of life index ranking. 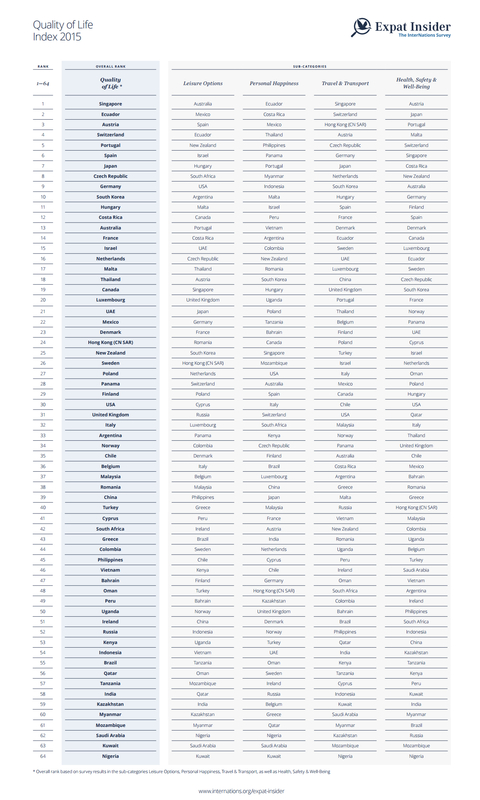 The Index includes 64 countries, ranked according to different factors such as leisure, personal happiness, travel and transport, as well as health, safety, and well-being. This year, “affordable healthcare”, “quality of environment” was added as new questions and “political stability” and “peacefulness” was considered individually to reflect new thoughts and feelings. Portugal jumped 8 places from last year’s ranking where got the 13th place. In 2015, Portugal is the 5th country with the best quality of life index leaving behind countries like Spain, Japan, Germany and many other European countries. Besides the overall rank, there are four sub-categories, which are leisure options, personal happiness, travel & transport, and health, safety & well-being. Portugal ranked number 3 in the health, safety & well-being subcategory and number 7 in personal happiness. The 2015 Quality of Life Index confirms that Portugal is one of the best options for expats to live, whether to work or to retire. The country enjoys mild temperatures all year-round, above the average and affordable healthcare and it is an overall safe country to live in and to travel to. American news website U.S. News listed the 15 best places for Americans who dream to retire in Europe and how affordable it is to fulfil the dream. Ordered by the average cost of houses per square meter, from the cheapest to the most expensive in Europe, Portugal ranks number 4. Meaning Portugal is one of the best places for Americans to retire. Retire in Portugal is a great option for those who enjoy the sun, the sand and golf. Mild temperatures all year round, especially in the Algarve area make it possible to enjoy outdoor activities even during winter months. Retiring abroad is becoming a growing trend among many Europeans. With the increased mobility between European Union countries, many pensioners decided to spend long periods abroad looking for a better way to spend their retirement days. Foreign retirees living in Portugal come mostly from France, the Netherlands, Switzerland, Ireland Poland and Brazil. It is estimated that more than 177 thousand French citizens are living their retirement in Portugal. Being the 3rd abroad destination choice for French people. Their main motivations are the lower cost of living, the weather and the fiscal advantages. According to an article in the French newspaper, Capital, for many years the preferred destination for French retirees was Morocco, but in the last few years Portugal has increased as is becoming the new retirement Eldorado. And the choice is quite simple because Portugal has advantages like the political stability, security, fiscal advantages, lower cost of living, good climate and easy living and is relatively close to France. Since the introduction of the Non Habitual Resident regime that allows European citizens to benefit from tax reductions in Portugal for 10 years – the reason why The Telegraph recently called Portugal a retirement heaven – many have chosen to apply for the regime and rent or buy a property in Portugal. Two of the main advantages of retiring in Portugal are the climate and the proximity to other European countries. Lisbon is 2 hours away by plane from both Paris and London. To better serve expats living in Portugal, Medical Port developed the For Health Card, a card that provides a privileged access to health, fiscal, real estate and leisure services. Click here to read more about the For Health Card.